Welcome to MyBinding video. 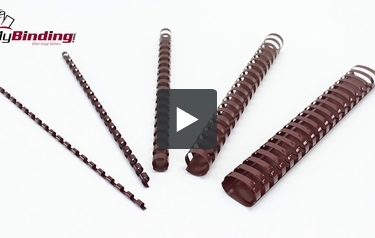 Here at MyBinding we have a wide variety of different sizes and colors of plastic binding comb, including brown. Ranging from 3/16” to 2”, there’s a comb for any size project. Brown is a great color that compliments other earthy tones and the 19-hole punch pattern is compatible to fit any standard comb binding machine. Not only that, these combs are made to last the test of time. They won’t scratch, chip, peel or discolor. And depending on what you need it for, this comb can be a great choice for your project. Because of the range of comb sizes that we have, you can fit from 1 sheet to 425 sheets and one of the best parts about binding combs is that they lay flat, making reading a breeze and allows for getting the right margins for photocopying. When deciding your next binding color, maybe give brown a thought. It might be the one you’re looking for. For more demos, reviews and how-to’s, go to MyBinding.com.